wheremmsgather: Honey! Do you have.....??? So, my husband says to me at 11:00 p.m. last night as I'm getting ready to crawl into bed, "I need to get a birthday card out to James' tomorrow. Can you pull one out of your stash for me?" What? Like I have tons of masculine cards laying around? I don't think so! James is my husband's eldest son from his first marriage, and I must admit that I screwed up by forgetting to make one in advance for him, but there was no way I was taking the rap for my oversight! I scolded dear hubby for asking me at the last minute! LOL! Awwww, don't worry about him. He knows I'm a softie and knew that I would come through for him. I got up early to do the sketch challenge on Splitcoaststampers this morning and set to making a birthday card for his first born. I hadn't used Baroque Motifs in a long time and thought it to be a good set for a masculine card. 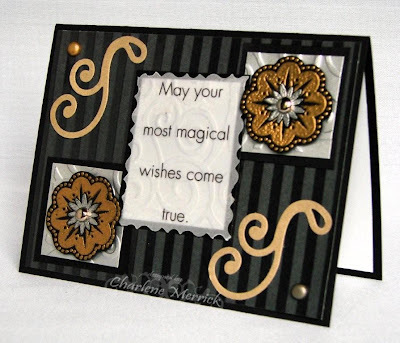 I gold embossed the scalloped circle shape and silver embossed the starburst center shape. The gold flourishes in the corner are from SU's brushed gold cardstock (I can't believe they aren't carrying that anymore and I'm almost OUT!!! Egads!). I used a Sizzix die for the flourishes. See the cool silver divine swirls embossed cardstock behind the Baroque images and underneath the vellum sentiment? That is really cool currency paper that Stamp Muse sent to me a short time ago. Reaaaaaallly cool paper! Thanks, again M!! The striped bg paper is from SU's Rockabilly designer set; I absolutely LOVE the Rockabilly papers. Note to self: buy more! What a beautiful birthday card, Charlene, and it's for a guy, too!!! The gold and black looks gorgeous and I love how you have the sentiment in the center....AWESOME work, gf!!! This is stunning, Charlene! This set make a wonderful masculine card...love all the embossing! Wow very elegant my dear!!!!! Very elegant!!! Love the black and gold and those flourishes!! Awesome!! This is such an elegant beauty and at the same time such a perfect guy card! I'm in total awe! Fabulous! Hi Charlene! Thanks for stopping by my blog! This card for #1 step son is great!!! I love the gold and silver together!!! Elegance and masculine all in one! Great use of the sketch! I wasn't home long enough today to even look at the sketch but it looks like a fun one! Great job and happy birthday to James! Isn't it so hard to create on short notice demand!!! but you pulled it off with this great masculine number! I'm sure he appreciated your efforts! This is quite nice Bertie! I love the masculine colors....its very cool! a gold necklace that is not yours? While you were at work today I got a phone call from the security people at the Windsor Castle. It seems that a gold necklace was lifted from the Queens' private bedroom and they say they have your finger prints! After I quit laughing, I told them there was no way, to double check their records cuz you were either at work all day or home with me! I know its just a mix up sweatheart, but I thought I better ask because they are calling me back tommorrow. When royalty is involved they have to be very thorough and they might even send some *people* to Michigan. Its crazy....no one here has been to the Windsor Castle. They said you were a part of the tea party! What do you suppose that was all about? It got more and more bizarre as the call went on. I am thinking it was a prank! Well, lets just see if they call back tommorrow! wow charlene! this is gorgeous! maybe if we hound stamping up enough they'll bring that gold cardstock back - ya think???? thanks so much for stopping by my blog and i'd be delighted to be on your blog roll. i'm adding you to mine too! don't want to miss any of the gorgeous creations you make - or the laughs! 1. I have no car and am about 3 hours from Pat Smethers. 2. The weekend is for our anniversary and I need to let DH take it easy after his surgery and not drag him all over the country to meet my friends. 3. I will come when you or Cindy or both can make it and it'd be even more fun! Hope you're having a good day, gf! Well, you gave the Rockabilly paper such classy elegance! I love Baroque Motifs. And what a sweetie you are to make it! Love this Charlene. I think it is perfect for a masculine card! Love that paper too!